When we dropped the anchor at Kennedy Cove off northwest Kioa, we knew it would be a temporary shelter as there were no houses (for social interaction) or beach to keep us happy for a week. 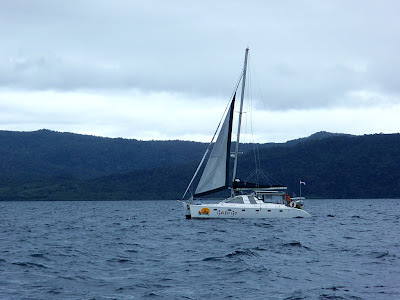 So, on Sunday morning We set sail for Albert Cove on Rabi (pronounced Rambi) Island. We had the jib out in 10-12 Knots from the SSW and were soon enjoying a very pleasant passage, guided by Google aerial maps and eyeball navigation, up the Georgia Channel. Craig off s/v Gato Go hailed us on the VHS and reported 25-30 Knots gusting off Rabi; they were on a reciprocal course. Chris had just raised the main but took it down again to be cautious. The wind changed as predicted to the SE and we were into gusts of up to 30 Knots coming off the island. This was fine for running up the channel but we were not sure if we could enter the pass as the wind would be on the nose and Ladybug has a small engine. We decided to overshoot the entrance for a better angle. Thankfully the seas were calmer here and we were able to navigate the two reef passes into the inner harbour without undue stress. Cocoa seeds when ripe have a tasty white covering and can be sucked like a candy. We will dry the seeds themselves for roasting and grinding to make cocoa. There were two catamarans to the north and a monohull to the south and we found a nice spot in the middle to drop the hook in 50 feet. Little did we know that this would be the beginning of an incredible week!